A couple of new books on the afterlife are now available. What do you take to the afterlife? What's important to God? What best gets you through the 'narrow gate'? There can be no more important questions, and this new book, by Catholic author Michael H. Brown, is aimed at many of the answers – culled from Church teaching, near-death experiences, saints, and other sources, including apparitions of the Blessed Mother. The Other Side, The Final Hour, Prayer of the Warrior, Sent To Earth, and Witness are his most popular titles. His secular books included Laying Waste: The Poisoning of America (Pantheon), which was excerpted or adapted in The Atlantic Monthly, The New York Times Sunday Magazine, New York Magazine, and Reader's Digest; and The Search for Eve (HarperCollins). 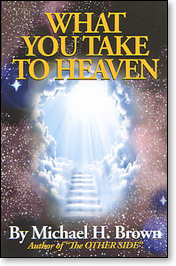 Click here to order a copy of What You Take to Heaven. 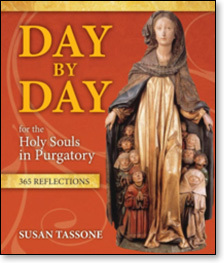 Catholic author Susan Tassone has a new book out titled Day By Day for the Holy Souls in Purgatory, published by Our Sunday Visitor. The following is the book's foreword, written by Father Mitch Pacwa, S.J. Susan Tassone begins with the Catholic teaching that the souls of people who had faith and love for God and for neighbor but died in an imperfect moral and spiritual state could still be perfected after death in purgatory. Though they are "assured of their eternal salvation," they still need to "undergo purification" that makes possible "the holiness necessary to enter the joy of heaven" (Catechism of the Catholic Church, n. 1030). These souls cannot earn any merits in purgatory but suffer passively there. Still, the prayers and works of the living can bring them merit and benefit (CCC, n. 1032). The next point permeates her whole book: we pray for the souls in purgatory simply because they need our prayers. A selfless Christian love for these suffering souls, whether we knew them in life or not, is the primary motive for praying, fasting, helping the needy in works of charity, and offering up suffering all for the relief of the pain these souls experience in purgatory. Frequently, the reflections in the book remind us that these souls undergo painful torment during their time of purification, a suffering that is primarily due to the absence of the direct experience of God's love. As truly redeemed souls, they know that infinite love awaits their cleansing that makes their ability to receive that love possible, and missing that love is the source of their pain. The passages chosen for each day of the year in this book evoke sympathy from the readers on a daily basis as they reflect on the insights of the saints, popes, Fathers of the Church, and mystics. Then, as we, the members of the Church still living on earth, offer our small sacrifices for them, they already experience various touches of love in purgatory, especially when Holy Mass is offered for their intention and they experience the death and resurrection of Jesus Christ as the true source and power of the love we offer for their sake. There are certain true gains for those who pray for the poor suffering souls in purgatory, to be sure. On one level, we make great spiritual progress by praying for the souls of people who have offended and hurt us in the past. This comes from a general principle that it is very difficult to remain angry with people who have caused you hurt, or whom you resent, or upon whom you seek revenge when you pray for them. Prayer simply dissolves the anger, resentment, and revenge, if you are willing to take that step. This certainly applies to the living, and it seems to apply to those who have died. Therefore, praying for the dead souls who caused us pain and suffering in the past evokes a new sympathy for them, a tender acceptance of their faults and failings, widens our ability to love them, and leads to deeper love for them. Not only will prayer for the souls of the dead increase our love for them, but it will free us to love God more truly and love the rest of our fellow sinners in this life. A benefit in praying for the poor souls is that our deepening love for them, despite the foibles and moral weaknesses that got them to purgatory, may also make us more aware of our own need in this life to pursue greater righteousness and holiness so that we can avoid purgatory. Prayer for those suffering on account of their venial sins and for the temporal punishment due to forgiven sins may well motivate us to move away from unreflectively accepting sin in our lives toward a thirst for greater moral integrity and sanctity. Another benefit of this book comes from the daily insights into the theology of purgatory. Little has been taught on this topic in seminaries, schools, or pulpits, making this compilation of texts by popes, councils, saints, and Fathers of the Church a useful source on the Church's constant teaching on the doctrine of purgatory. Meditation on the daily passages from Scripture and the reflections will strengthen a Catholic mind on this teaching, in addition to evoking a deepened love for the poor souls. This may well awaken a love of the faith and its truth, an ever-greater love of God and neighbor, a firmer desire to avoid hell and the sins that lead one there, and a hope and desire for the eternal bliss and beauty of existing with the good God in heaven for all eternity, directly experiencing his infinite love. Read this book prayerfully, and let us pray for each other that "we may ... cheerfully meet in heaven" (St. Thomas More's words to those who condemned him to death). – Father Mitch Pacwa, S.J. Click here to order a copy of Day By Day for the Holy Souls in Purgatory (currently OSV's number one best-seller).